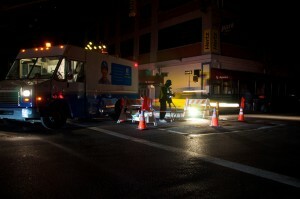 A Con Ed worker makes efforts to restore power in the wake of Hurricane Sandy. The East Coast’s Infrastructure was heavily damaged by this storm, testing not just our survival skills, but how well we preserve our data and memories. Photo by Robert Francis on Flickr. No greater a test of our resolve and our preparedness exists than a true trial by fire, and the past two weeks have been living proof of this. There isn’t any way to overstate or exaggerate it. Hurricane Sandy devastated New Jersey, New York and other sections of the East Coast, taking away lives, homes, power, and safety. It could take years before a sense of normalcy is restored for the lives of those most impacted, and as has been stated by many officials and news outlets: it will never be the same. A stark reality coming from this is the notion that landmarks and attractions washed away by the storm will now exist only in memories, and in people’s photo and video archives. But what hasn’t quite been acknowledged fully just yet, is that Sandy has also taken a toll on the archival and digital front as well. For some, Sandy was just a rather annoying inconvenience. Power and heat were out for a while. Cell phones didn’t work as well as they used to. Internet access was scarce, and websites were taken offline for a few days until power was restored. This very blog, for instance, had an emergency plan that kicked in when its usual home base at Rutgers sat safe but idle, without electricity. It was digitally “evacuated” to a backup cloud datacenter in Los Angeles for a few days, until all was clear and the power was back on. These were the lucky ones. Others fared so much worse. [Shamus] Barnes, 43, has spent every summer he can remember here at the sandy tip of the Rockaway Peninsula. Those years were lovingly documented in photos of what his family calls “the pyramid” — the intergenerational group photo op that seemed to grow larger each year. Those photos were lost when, in the midst of Sandy’s assault, fire destroyed more than 100 houses on Monday, including Barnes’ and his parents’ homes. Sadly, the events of these past two weeks have meted out a cruel lesson: use the technology you have to save your important memories, before it’s too late to save them. Storms can take away our physical possessions, but our photos, videos, recordings and documents can always be saved, if we work to keep them safe. We can’t always get back what is lost, but we can take steps to prepare for what may come. Keep a local backup of all your important stuff. Supplement that local backup with a remote, or cloud, backup. And I’ll add: do some research to make sure that this cloud provider is in a different geographical area from where you normally keep your digital stuff. This way if your local backup is just as waterlogged as your computer, you can still get your stuff back. I haven’t written about this part yet, but you should even back up your mobile devices. It’s easy to do, whether you have an iPhone or an Android device. Yes, many of these options cost money. But they’re quite affordable to most people who own their own computers and pay for their own internet access, and the costs are astoundingly low when they’re weighed against the value – sentimental and otherwise – that is lost when your digital stuff is gone forever. If you didn’t have a backup plan and were affected by Hurricane Sandy, it’s possible that not all hope is lost. This article has tips on what you can do to minimize water damage to computer hardware, and possibly save your data. If your computer’s hard drive was waterlogged or otherwise damaged, some of the data inside might still be salvageable as well. DriveSavers, a data recovery service out of Novato, California, is offering $500 off its data recovery services to Hurricane Sandy victims. Here’s to hoping that no one will ever have to experience such great losses again. But in case we must, let’s take the steps we need to better prepare for next time.